There are other improvements aside from the bigger storage option, of course. The NVIDIA Tegra 3 processor has had a speed bump to 1.7GHz -- perhaps in an effort to challenge the Galaxy S III's benchmarking might. There's a larger 2,100mAh battery to stay in step with that more power-hungry silicon; the front camera module has been replaced with a higher-res chip and better image processing; and, there's also some new audio circuitry to improve the speaker's sound quality. The One X+ also runs HTC's updated Sense 4+ skin, based on Jelly Bean, which will eventually arrive on older One-series phones as well. As for the rest of the spec sheet, all the good and not-so-good stuff from the One X has carried over -- the stunning 4.7-inch, 1,280 x 720 Super LCD2 display is still here, thank goodness, and so is the 8-megapixel f/2.0 rear camera. However, there's still only 1GB of RAM (LG and Samsung flagships boast double that). So, what's needed here is an upshot: if you haven't made the leap to a 2012 superphone just yet, how does the One X+ carry itself relative to its cheaper predecessor and the latest competition? Read on and we'll endeavor to find out. The One X+ adds a lot to the original global (non-LTE) One X, especially for power users and music lovers, but both the camera and the battery life pale slightly compared to other high-end Androids. How would you rate the One X? The key selling point of the original One X has never been in doubt. It has a design flair that many other Android phones before and after have lacked, and although the One X+ is marginally heavier (at 135 grams versus 130 grams) it's still the same classy phone. A Gorilla Glass panel -- here upgraded to version 2 -- blends seamlessly into the curved, matte polycarbonate unibody and the overall effect is beautiful and durable in equal measure. Yes, the one-piece build precludes expandable storage and a switchable battery, which are major sacrifices for many users, but in return it rewards you with pleasant vibes every time you pick it up in the morning. "The ratio of black to red is high enough that the phone never looks garish"
But even by this slightly superficial measure, the One X+ is not perfect. That's because it only comes in one color: matte black, with glimmers of red on the navigation buttons (especially when they light up), the camera ring and the Beats logo. The AT&T model is slightly sexier perhaps, with black accents instead of red, but there's still no sign of multi-hued love HTC has showered on its latest Windows Phones. If you're the fastidious type, you may also notice that this darker variant is slightly more smudge-prone than the lighter grey and white colors, and also the glossy black HTC logo at the back is something of a dirt trap. In case it helps, we've added some comparison photos from our previous hands-on session below. In terms of the device's physical layout, there are no surprises. The face is adorned by three capacitive hardware buttons along the bottom (back, home and multitasking) plus the front camera and earpiece, with a somewhat discreet HTC logo just above the display. (Take note, Verizon, you fiends.) 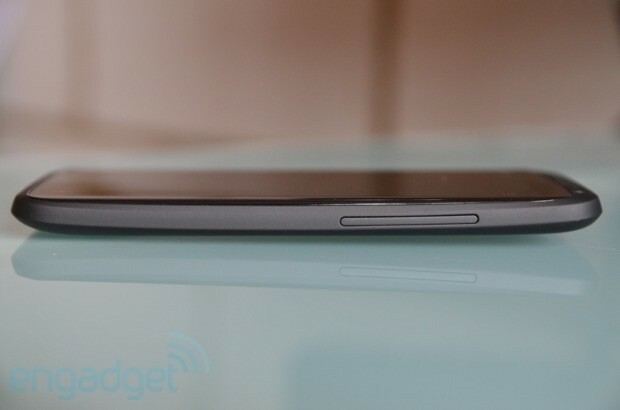 On the right-hand edge we have a good-sized volume rocker, while the power button sits on top beside the 3.5mm jack and the micro-USB port is the sole occupant of the left-hand edge. It's a good and functional layout, but folks with smaller hands may wish there was an easier-to-reach power button on the side instead of on the top (as with the Galaxy S III, for example). Shifting your grip to turn the phone on does become a habit, but it takes a while. On the rear side, we find the protruding camera, which has become symbolic of HTC's top-end line, but which is still prone to scratching, with a small and not especially powerful LED flash to the side. There are charging points on the lower right for compatibility with a range of existing One X docks, and finally the loudspeaker at the very bottom. HTC tells us that a feedback amplifier has been added to this speaker to improve its sound output versus the One X, and indeed we found the speaker to be less prone to distortion when set to maximum volume. As our video review shows, the difference isn't huge, so don't go expecting miracles or hosting house parties without proper audio equipment. We need to deal with that other big aspect of this phone's audio output: Beats. If you ever read our review of the HTC Sensation XE, which was the first phone to come with Beats Audio, then you'll know we didn't think much of it. As far as our tests showed back in 2011, it was basically an S-shaped EQ setting; it exaggerated certain bass and vocal frequencies and slightly boosted overall volume. This was enough to give listeners a wow effect with the right type of music, but the same effect (or better) could readily be achieved with any decent music player for Android. But times have changed and the Beats we see on the One X+ is very different. For starters, it can be enabled or disabled regardless of what headphones you plug into the 3.5mm jack, so the old pretense of only coming to life with Dr. Dre-approved cans has been quietly forgotten. The marketing has improved slightly too. There's still plenty of misleading babble, such as the unfathomable claim that Beats delivers "studio-quality sound," but at least HTC doesn't put so much emphasis on Beats as a selling point any more, and it also gives slightly more clarity on what Beats actually provides -- e.g., a "deeper bass" and "crisper vocals." The most ironic thing about Beats actually has to be this: despite the mellowed marketing, it's probably more useful on the One X+ than it ever has been. This is because it now comes with a really hefty increase in volume: in other words, max volume is substantially higher with Beats enabled, whereas in the past (for example on the One X) it increased by a much smaller proportion. So long as you can tolerate the exaggerated frequencies that come with it, this can be a big help if you want to play music through over-ear cans with above-average impedance. 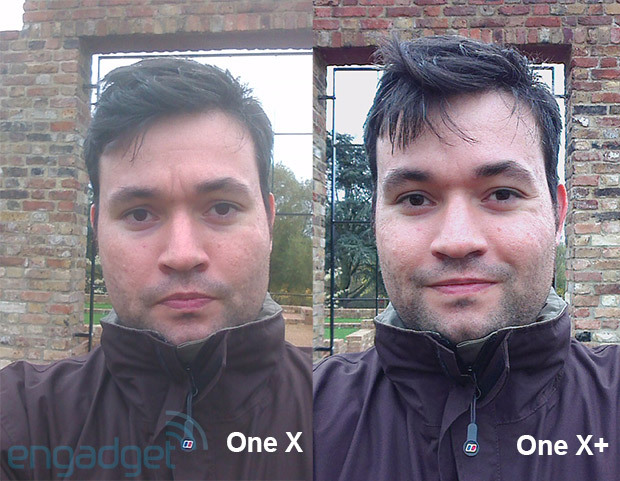 The biggest photographic improvement with the One X+ is undoubtedly its front-facing camera. It's not the higher resolution (1.6 megapixels) that makes the difference -- in fact the final output image is still 1,280 x 720. The power of this shooter actually lies in the quality of the sensor and in the image processing hardware, which together make it a great tool for video chats and self-portraits. The image above speaks for itself, and not only is the shot on the right much clearer and more detailed, it also has a more natural pose thanks to the One X+'s new 3-2-1 countdown feature. "There's still no ability to lock exposure and focus before re-framing a shot"
According to HTC, the rear camera hasn't evolved at all -- we're looking at exactly the same module as the One X. But having taken a number of shots and videos side by side with the two phones, we reckon the One X+ has a slight advantage thanks to its faster processor. In burst shot mode, the One X+ snapped 20 pictures in just three seconds, whereas the One X took five seconds. When starting a video recording, the One X+ got going a whole second faster, and its auto-focus seemed to respond quicker too. Of course, extra speed in and of itself isn't going to give you better image quality, and it's in this area where we found the One X+ to be most disappointing, simply because it hasn't fixed any of the quirks present on the One X. For one, there's still no ability to lock exposure and focus before re-framing a shot. This is a big deal because it makes for erratic exposures that are largely outside of your control -- in fact, when trying to take an identical side-by-side shot with the One X and One X+ we found it virtually impossible to get the same exposure and focus on both cameras, not because one is better than the other but because they both seem to work primarily on luck. Another problem: the video data rate hasn't been improved at 1080p, even though we now have a more capable processor, along with more storage to fill up. We captured a high-detail scene above just to prove the point -- it's riven with compression artefacts. The Galaxy S III has a higher video data rate, not to mention two-stage stills shooting, and as a result we'd still say that phone (along with the Note II) has the all-round superior camera. The HTC's saving grace is its low-light performance, which benefits greatly from that fast f/2.0 lens, but which is slightly marred by HTC's detail-destroying anti-noise filter. So much for the outside -- it's the internals that HTC is really relying on to get this handset into people's pockets, and most notably that 64GB of internal storage. On our review device, this yielded around 56GB of usable space, which ought to be enough for most. We plugged the phone into a PC and it automatically switched into storage mode and made swift work of swallowing up an entire 50GB collection of high-quality recordings -- a nice feeling that was never previously possible. The handset was predictably capable with voice call reception and sound quality, and in terms of mobile data it behaved identically to both the One X and the Galaxy S III on Vodafone UK's HSPA+ network in London. Speeds varied wildly depending on signal, but no more so than with other devices, and they generally hovered somewhere between 1-3 Mbps down and 1-2 Mbps up. Wireless tethering worked flawlessly and was very stable. As mentioned earlier, our review device was 3G only, which is strange considering that LTE is about to take off in the UK in a big way -- if you're contemplating switching to an LTE carrier like EE in the next year or so, then you should probably bear this mind. EE already offers the One XL (the Qualcomm-powered, LTE version of the One X) as part of its LTE launch lineup. 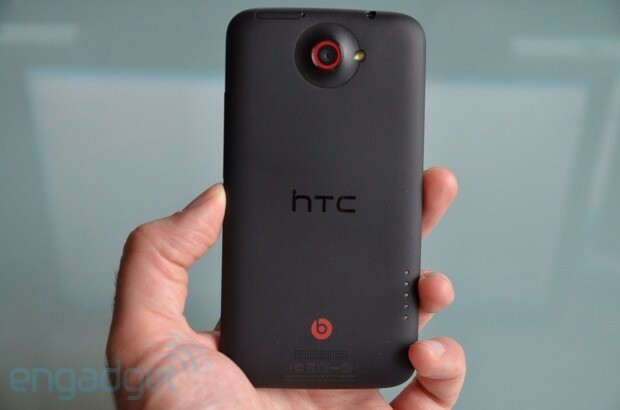 "Why didn't HTC go for the S4 Pro here, rather than a souped-up Tegra 3?" The engine in this handset is the AP37 variant of NVIDIA's Tegra 3 chip, which consists of four main cores plus a low-power companion core, with a maximum single-core clock speed of 1.7GHz. This compares to the AP33 silicon in the One X, which maxed out a 1.5GHz. The newer GPU also gets a boost, from 416MHz to 520MHz. The improvement is visible in daily operation simply because everything happens quicker -- often with a half- to one-second edge over the One X -- although we're comparing jelly beans with ice creams here, so its hard to know how much of this difference is solely due to the hardware rather than the updated OS. It's worth pointing out that Vodafone UK's HTC One X recently got a major update that made it much snappier (as you'll see in the benchmark table below). When the One X gets its Sense 4+ refresh, the gap may be reduced even further. Overall, our new suite of benchmarks resulted in some mixed scores, which hint at this Tegra 3 being a very capable, but also slightly lopsided, processor. What do we mean by that? Well, in those scores where it shines -- such as AnTuTu -- this is mostly due to its fast CPU and RAM, rather than any particular graphical prowess. More importantly, those high CPU scores come at the expense of battery life -- as we'll explore further in a moment. 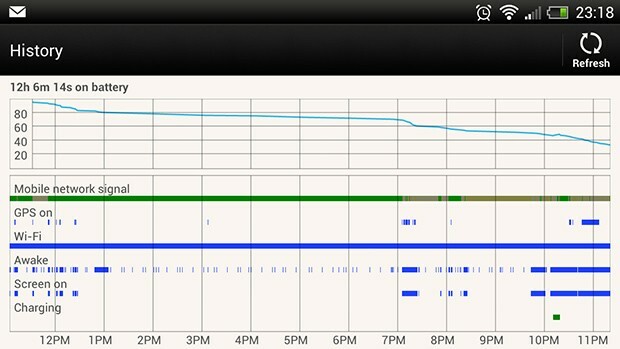 The Snapdragon S4 Pro-powered LG Optimus G, meanwhile, has marginally lower CPU scores but far higher graphical scores (e.g. GLBenchmark) and also much, much better battery life. One can't escape the question: is HTC holding this expensive S4 Pro processor back for its real next-gen flagship and fobbing us off with a spot of power-hungry overclocking in the meantime? On the other hand, for the sake of perspective, you shouldn't be too put off by the GLBenchmark test below, because it's almost unrealistically taxing. Pick a game from the Tegra Zone store front -- like Shadowgun: Deadzone -- and you'll likely be more than pleased with the graphical quality and frame rates. Lower SunSpider scores are better. Scores in brackets are pre-update. NB: We initially reported a SunSpider score of around 1,300 for the One X+, but that was mistakenly taken with Chrome instead of the stock browser, which actually proved to be significantly faster (and is also how the other phones were tested). Let's explore this battery issue in a bit more depth -- because given the technical context, it's really not that surprising. Although its clock speed has been increased, we're still looking at basically the same 40-nanometer silicon from which the old AP33 chip was carved. The latest 28nm and 32nm chips from Qualcomm and Samsung are just inherently more efficient, and while the Tegra 3 may be a great choice for a device like the Nexus 7, with its low price and big battery, we're not sure it belongs in a late-2012 flagship smartphone. The problem isn't with regular use or standby, but with processor-hungry tasks like gaming and multi-tasking, which made the phone warm and seemed to drain the battery slightly too quickly. The phone easily lasted for a day of very light use, with 30 percent of its juice left over after 12 hours, but that particular day included nothing more strenuous than 30 minutes of camera work and a few calls and emails. In our regular looped-video test, the phone last seven hours and 32 minutes, which is slightly worse than the almost eight-hour duration we recorded on the post-update One X and still far, far below the nine-hour threshold set by the Qualcomm-powered AT&T One X and the Samsung Galaxy S III. To get the measure of the user experience on the One X+, you really need to check out our full reviews of both Sense 4 and Jelly Bean. Merge the two and you get Sense 4+, which is the same friendly, relatively lightweight skin as before, but with some fundamental improvements that mainly come from the shift to Android 4.1. 1. 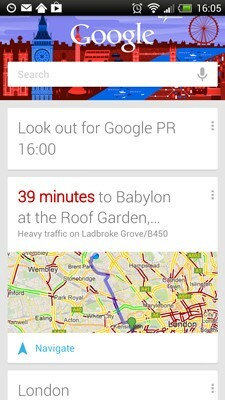 Google Now. If you imagine the traditional Android home screens as lying along a horizontal line, then Google Now turns that shape into a T. That tail is useful because it adds depth to the OS, in the form of a vertical row of "cards" which appear when you long-press the home button, and which grow intelligently based on what Google can glean about your life. Within a few days of using the One X+, we had cards waiting for us with the local weather forecast (much more nicely presented than HTC's own weather widget), local bus routes and times, and an entire card dedicated to a very well-visited local coffee shop. It's not perfect, however. Some cards weren't useful at all, including a calendar card that only had room to display one appointment (and it was invariably someone else's from a team calendar). More seriously, Google Now can have an unwieldy feel to it, like it's the start of a new OS growing inside the belly of the old one -- something that adds functionality but probably also represents the peculiar ability of Android to scare some people off with its complexity. 3. Project Butter. We can't pretend that this makes a huge difference, but it's certainly noticeable if you look out for it. It involves Jelly Bean ramping up system resources whenever you touch the screen to navigate, such that all animations and transitions and movements on the screen are able to run at a clean 60 fps. Even during our brief hands-on we noticed that the notification pull-down moved more cleanly across the home screen, and now it just feels weird to go back to the original One X. 4. A new, aggregated gallery app. This is an HTC addition which organizes photos by event and location, resulting in somewhat handier presentation -- even if your photos tend to all be taken near your home. It also gives you quicker access to your local and cloud-stored photos bringing all those icons (Facebook, SkyDrive, etc.) together in one place. You could access your photos individually through each associated app, but over time we found it made sense to collect images together in this way. 5. HTC Get Started. This is an app that lets you use a PC to configure your phone more quickly, since you can type out your credentials on a full-sized keyboard. We used it to set up Hotmail and Dropbox, and to set up a gallery picture as wallpaper, but that's about it. The choice of accounts is too limited -- we still spent ages setting up Facebook, Twitter, Netflix, Evernote and everything else from the phone itself. "PlayStation Mobile? It still doesn't work." 5. HTC's Music app, which works in a similar way to the Gallery in attempting to bring together local and cloud-based content. The problem here is that you can't make playlists across different sources, which renders it pointless -- you might as well access each music source through its own app. 6. HTC's Sense keyboard. HTC has never been great at onscreen keyboards and the One X+ maintains the trend. We instantly switched it out for SwiftKey, which meant losing the new Google-powered word prediction that comes in Jelly Bean. 7. PlayStation Mobile. Guess what? The app still doesn't work -- which rather takes the meaning out of PlayStation Certification. There's no question that with the One X+, HTC is offering more to Android power users outside of the US. What's less clear is whether it brings more in the areas that actually matter to you. The answer is "yes" -- but only if you meet some rather narrow criteria. If you loved the physical design and excellent display on the original global One X but were put off by its 32GB storage cap and second-best performance, then this new flagship is definitely worthy of consideration. It's extremely snappy, beating rivals phones on certain computation-heavy tests, and its graphics engine delivers a perfectly smooth experience even on the most visually-demanding tasks and games. What's more, the phone achieves all of this without making battery life any worse than it was before. On the other hand, if you weren't particularly drawn to the global One X in the first place, and if you make more mainstream demands on your phone, then you should be more circumspect about this proposition. At the top of the top end, the Padfone 2 and Nexus 4 (along with its cousin, the Optimus G) have dented a lot of egos with their shockingly powerful and well-rounded S4 Pro chip -- and this new souped-up One X+ just can't keep up. Meanwhile, the Samsung GS III and Note II come with better cameras and longer battery life. And if you peer over the platform divide you'll see that the iPhone 5 does so too. 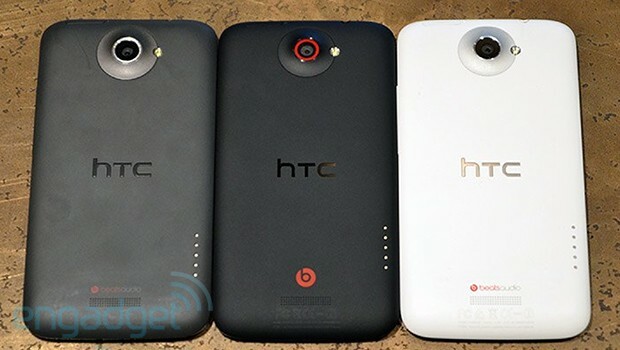 Compared to these phones, the HTC One X+ is a missed opportunity. It could have been an S4 Pro-powered phone. 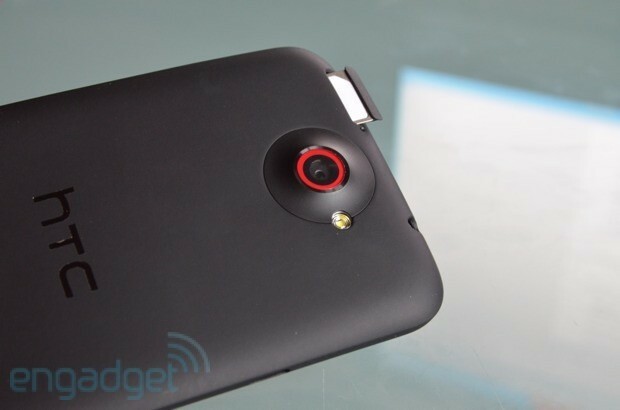 It could have been tweaked to deliver superior stills and video recording, and it could have come in more colors. But instead HTC has decided to play it safe -- at least for now. In fact, one of the biggest impressions left over by the One X+ is that it highlights all the continuing strengths of the regular One X. This device has benefited from extremely positive updates since we first reviewed it, with great improvements to all-round performance and battery life, and it's due to get Sense 4+ within the next couple of months too. If you don't mind taking out a contract on a phone that is already seven months into its cycle, and if you can find the One X at a bargain price as a result of the One X+ weighing down at the top of the HTC stack, then it's perhaps a more savvy purchase than its newer, flashier big brother.